Norman Podhoretz, the neoconservative guru, once asked the most cosmically stupid question I ever heard: “Why does [Nelson] Algren always write about bums?” Well, first of all, bums exist. I’ve seen them in every part of the country I’ve ever lived in. I’ve talked to them. I have given some of them rides on occasion. Let’s look at the question another way. Leo Tolstoy wrote about Russian aristocrats. Thomas Mann wrote about middle class Germans. You write about what you know about. That may be a platitude, but ideas become platitudes because they happen to be true. When John Steinbeck wrote about the European resistance in World War Two, the result was flat and unconvincing. He was more successful writing about Okie farmers who lost their land. This is partly because he actually talked to such people, and partly, and perhaps more importantly, because he something about the physical environment that these people lived in. I felt then, as now, that the presence of the YMCA, of settlement houses and of churches… could have no greater modifying effect on incidence of local crime than so many loan agencies, so long as the people who run the schools, the people who run the churches and the banks, the people who elect people and get out the newspapers feel no identification with the outcast man and the outcast woman. Anything less than such identification is contempt – and no man is quicker to sense contempt than the outcast. None is more swift to return contempt for contempt. Nor all your pity nor all your preaching, nor all your crusades nor all your threats can stop one girl from going on the turf, can stop one mugging, can keep one promising youth from becoming a drug addict, so long as the force that drives the owners our civilization is away from those who own nothing at all. The novel tells the story of Bruno “Lefty” Bicek, a small-time hoodlum and aspiring boxer in 1930’s Chicago. He works for Bonifacy “Barber” Konstantine, a petty gangster and pimp. (Barber’s apartment is decorated with parrots in tiny cages, a metaphor for how he controls other people.) Bruno’s girlfriend, Steffie, is raped by thugs working for Barber and forced to work in his brothel. Meanwhile, Bruno is arrested for a robbery and spends time in jail. During this period, he is haunted by the fear that the police will discover that he once killed a man in an alley fight. After his release, Bruno is offered a large amount of money to box a well-known fighter. He sees this as his opportunity to rescue Steffi and to start a new life. However, Bruno finds that breaking free of the Barber’s control is not an easy thing to do. Never Come Morning is a work of heart-breaking beauty. 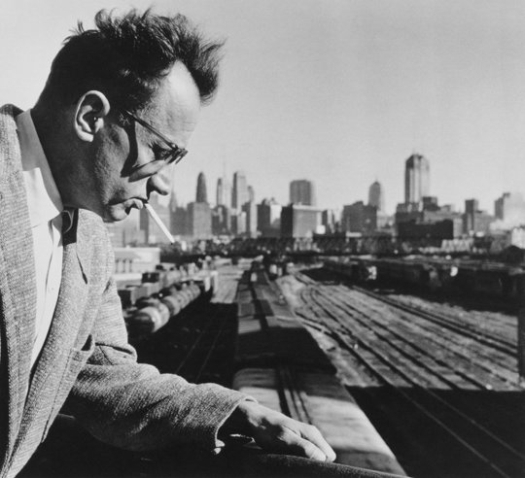 The story’s brutality is leavened by the compassion and understanding that Algren shows for his characters. I consider it one of the great novels of the twentieth century. This entry was posted on October 23, 2010 at 5:40 am and is filed under Literature. You can follow any responses to this entry through the RSS 2.0 feed. You can leave a response, or trackback from your own site.